Apple Hill is one of El Dorado County's biggest attractions! Boasting of over 50 ranches and orchards including wineries, a micro-brewery, spa, and vineyards. Every year thousands of visitors travel great distances for the big September opening! The prime Apple Hill season begins Labor Day weekend and ends early December. During this time your family can enjoy a large array of activities at the ranches including pony rides, hay-bale mazes, corn mazes, petting zoos, nature trails, pumpkin patches, craft making, candy making, face painting, scavenger hunts, fishing, kite flying, paddle boats, pick-it-yourselves, and more! Enjoy the famous Apple Hill fresh baked apple pies, unfiltered and unpasteurized apple cider, various bakery delights, fudge, candy, carmel apples. Try the outdoor pig roasts for pulled pork sandwiches, hamburgers, veggie burgers, tri-tip, rotisserie chicken, tacos, and many other selections! Adults can enjoy an incredibly diverse selection of fine wines by visiting one of the many Apple Hill vineyards offering breath-taking views of the American River Canyon while picnicking. Play a little bocce ball on competition courts while your children get their energy out on private playgrounds. Women can pamper themselves at a luxurious day spa while the men spend some time at an English-styled brewery. 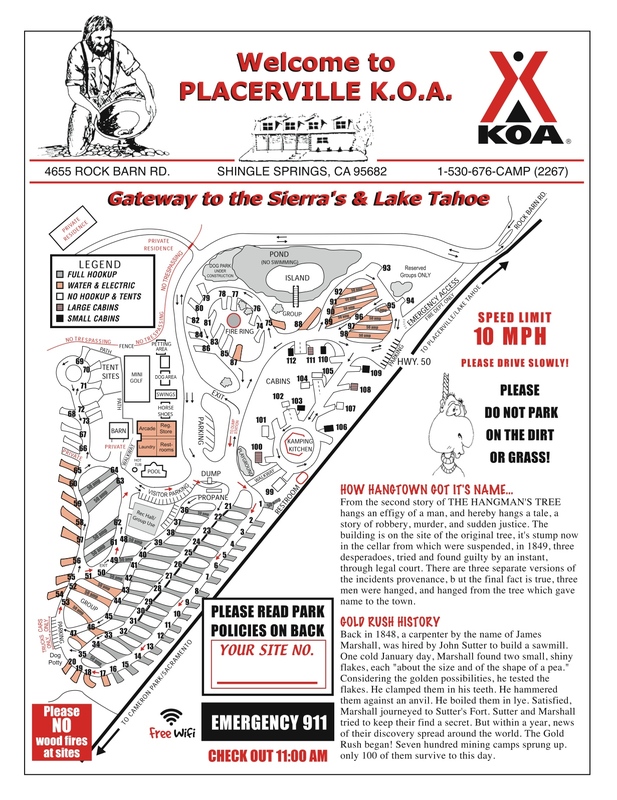 Placerville KOA Campground offers the best variety of accommodations for your visit to Apple Hill. Come settle in to one of our cozy old fashion camping cabins, a shady tent site with electricity and Kamping Kitchen privileges, or bring your RV and take advantage of our resort styled campground! Our KOA has hosted thousands of guests and large groups to get the most out of their Apple Hill experience. The campground is located only 15-20 minutes away from many of the Apple Hill ranches as well as the starting point for the Apple Hill shuttle buses that run during October. Click here to visit the Apple Hill Growers Association for listings, schedules, & maps! ©2010, Placerville KOA. Gateway to the Sierra’s & the Red Hawk Casino. All Rights Reserved.